Now that we’re into June, I’m hoping warm, backyard-hanging weather will linger longer than a day before temperature drops 20 degrees the very next day. Yes, it’s been happening! Although the past several weeks have been mostly cool and rainy, we’ve managed to host a couple of pool parties already. 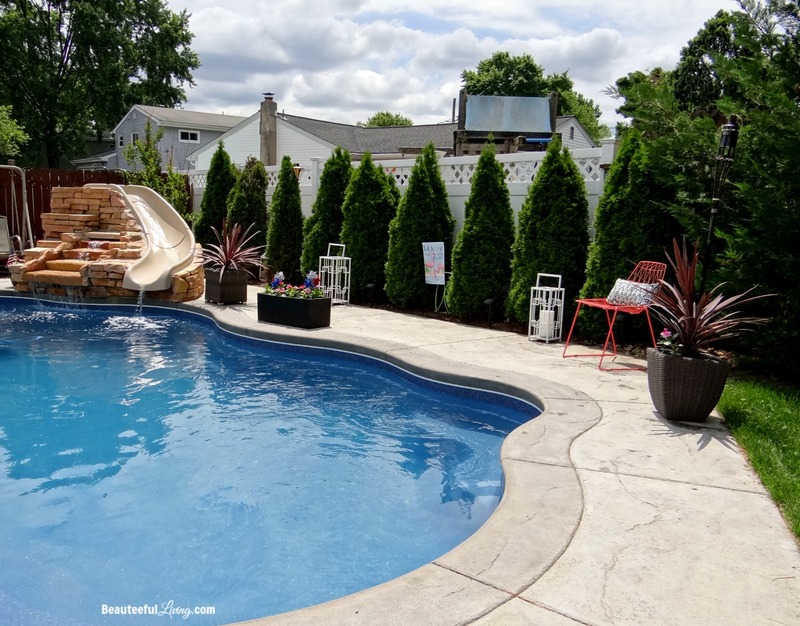 Since our pool area in our backyard is our favorite place to hang during summer months, I thought I’d share some current photos of this space as part of this year’s Garden Tours and Outdoor Spaces Blog Hop, hosted by my friend Tara from Lehman Lane. Affiliate links are provided in this post for convenience. For more info, please see my full disclosure here. When we’re by the pool or have guests over during summer months, we typically dine in this outdoor dining area. Having an 11 foot patio umbrella helps shield everyone from the sun. This is the side of our yard that gets full sun starting in the morning to around 3pm each day. 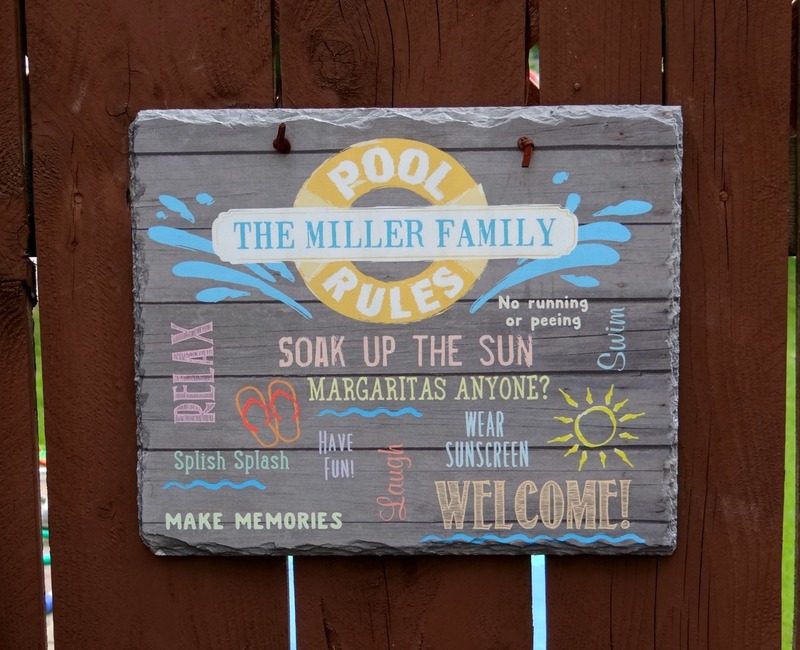 How cute is this personalized “Pool Rules” sign? This was a gift from one of our friends after we had our inground pool installed. How thoughtful and sweet! Here’s how our pool looks currently. We haven’t changed much with the decor around our pool from last year. The arborvitaes by the fence are doing quite well. They’ve grown around 12 inches within the past 2 years. I just can’t wait for them to grow into each other even more. A tall wall of greenery is what I’m after! What’s the secret to hosting pool gatherings on the fly? This pool cleaner is the best thing since the creation of Oreos Thins! 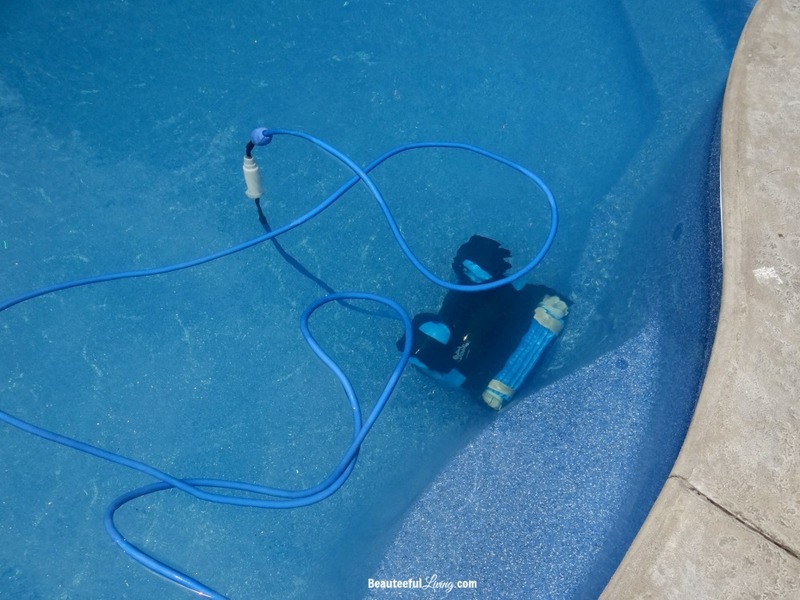 Before any gathering, we just throw this cleaner into our pool and within a few hours, most of the the debris at the bottom of our pool gets vacuumed away. You can read more about this handy robot here . 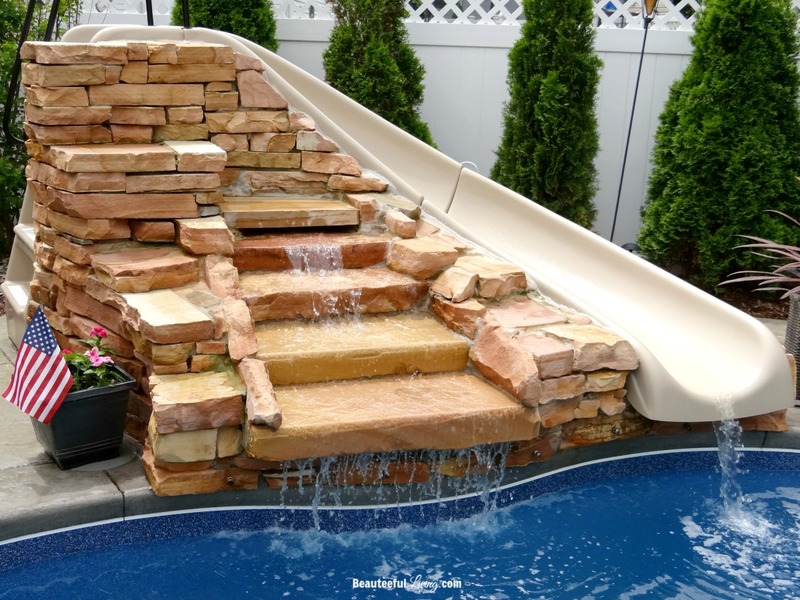 Trust me, this thing is worth every penny if you have a pool to upkeep. This robotic machine actually climbs the walls of our pool. Is it weird that I enjoy watching it move around the pool? HA! Where do all the kids hang around during our backyard parties? I can’t get over the selection of cute pool floats available these days. 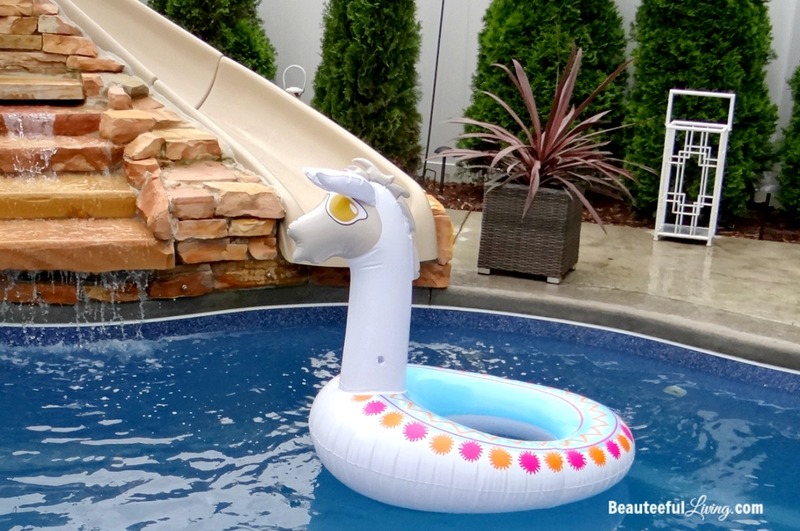 How adorable is this llama float? Why stop with just 1 float? We typically have at least 3 in our pool. You can find these floats at Five Below. If it’s not a pool kind of day, we can hang by the other seating area near our pool. 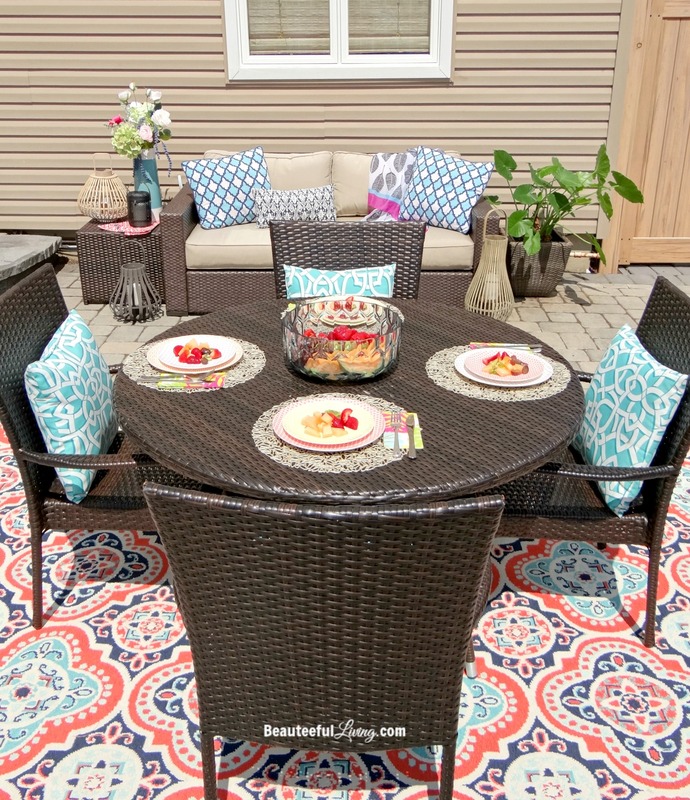 In case you missed it, I shared this space in my recent Outdoor Entertaining blog post. Can you tell I’m a big fan of color and geometric prints? 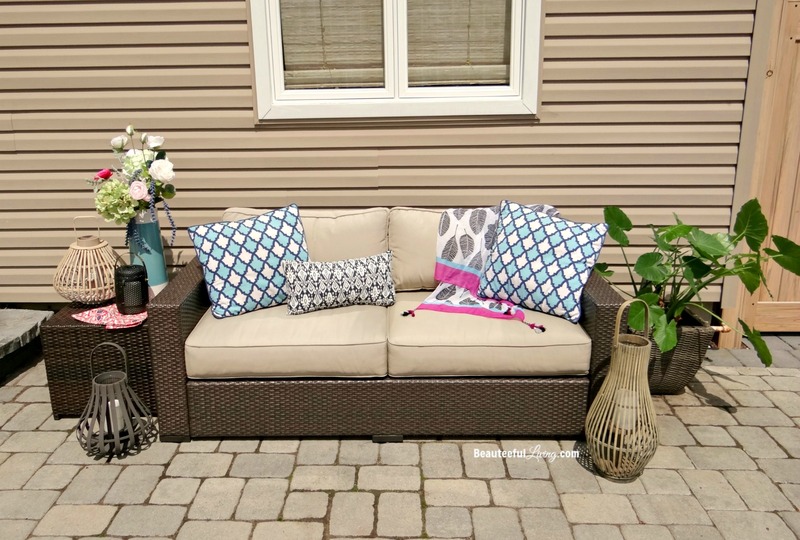 You can read more details about how I styled this backyard space HERE. I hope you’ve enjoyed my little tour around the pool area in our backyard. We’re just a few weeks away from summer but as far as our backyard is concerned, it’s already SUMMER! Let’s hope Mother Nature gets the memo though. 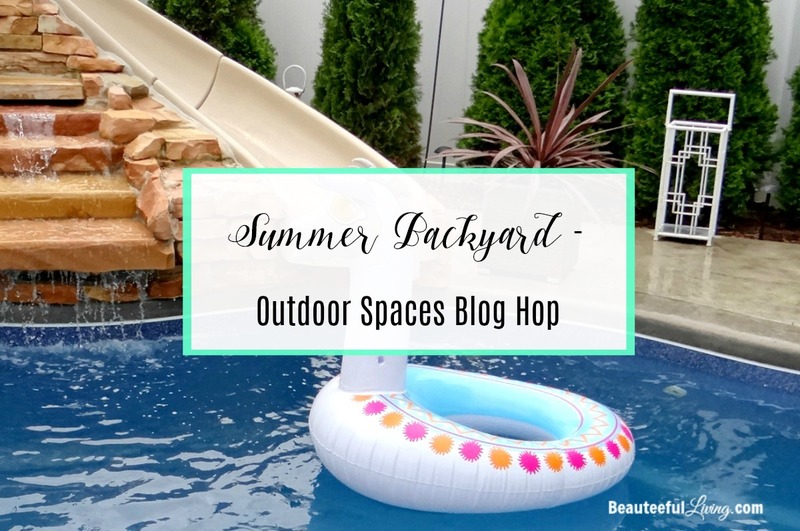 Be sure to check out these wonderful outdoor spaces from my talented blogger friends below! P.S. Follow along Beauteeful Living on Instagram and Facebook for extra content. Wishing I was your neighbor right now… 😉 Your pool is a-maz-ing! So fun to see the landscaping growing in around it! I love how you decorated your seating areas and all the bright colors! Tee, your pool is SO gorgeous, and I love that waterfall too! 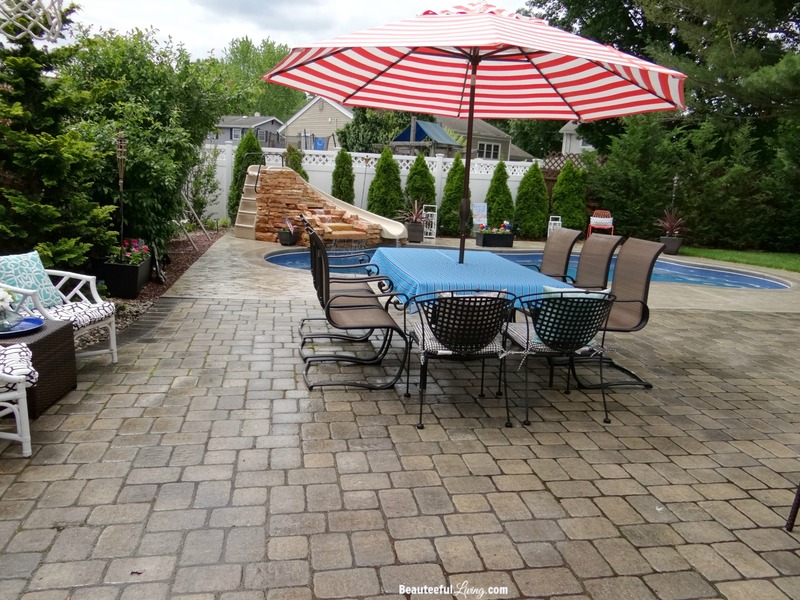 You have one of the absolute best backyards – such a perfect place to enjoy summer! 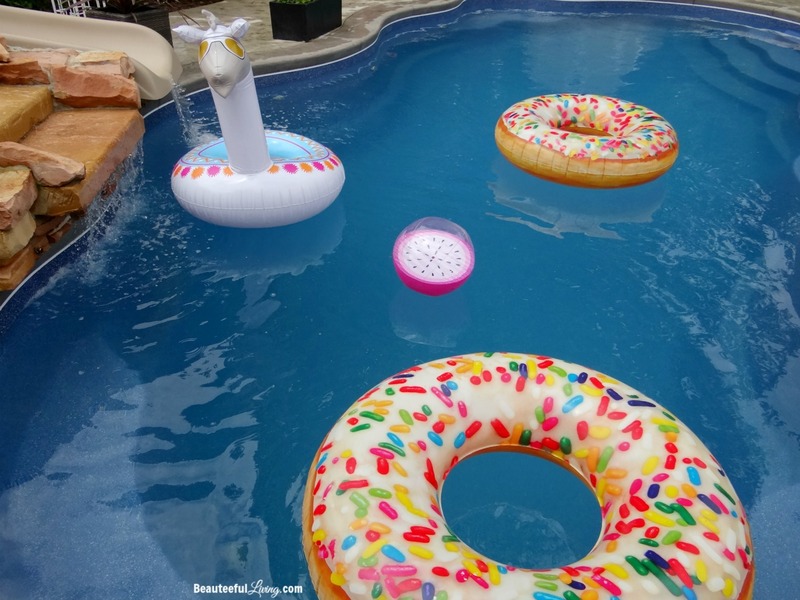 I love those little chairs and the doughnut pool floats!! You’re the sweetest, Meg. Thanks so much! 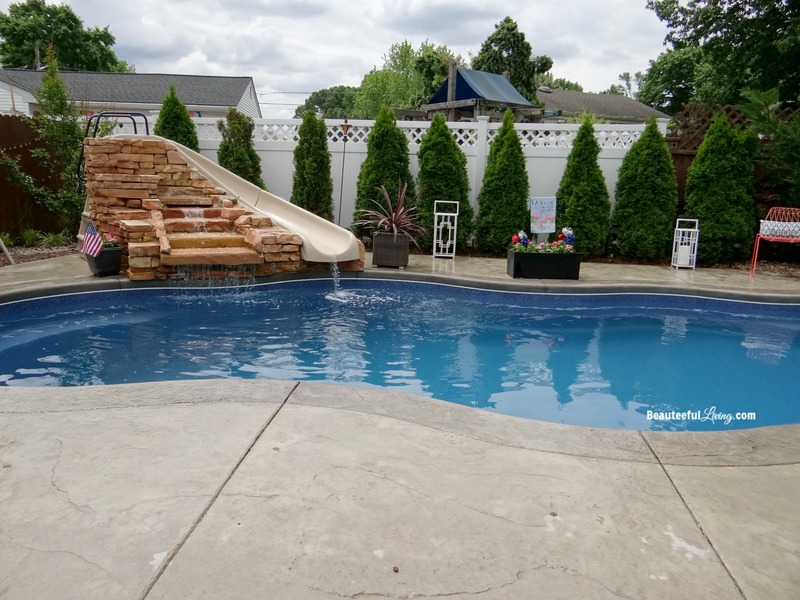 Your backyard and pool look amazing Tee! 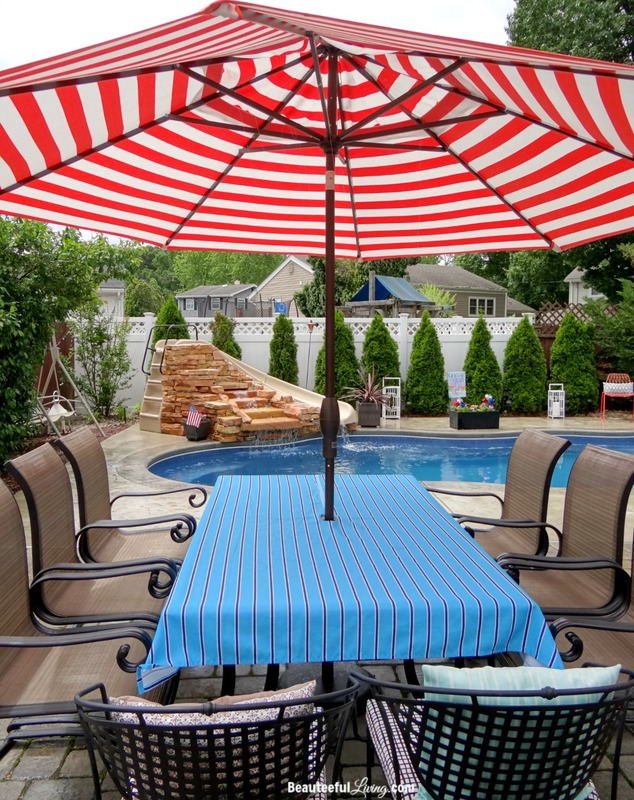 Love your huge striped umbrella, all your outdoor seating and that pool robot is awesome. 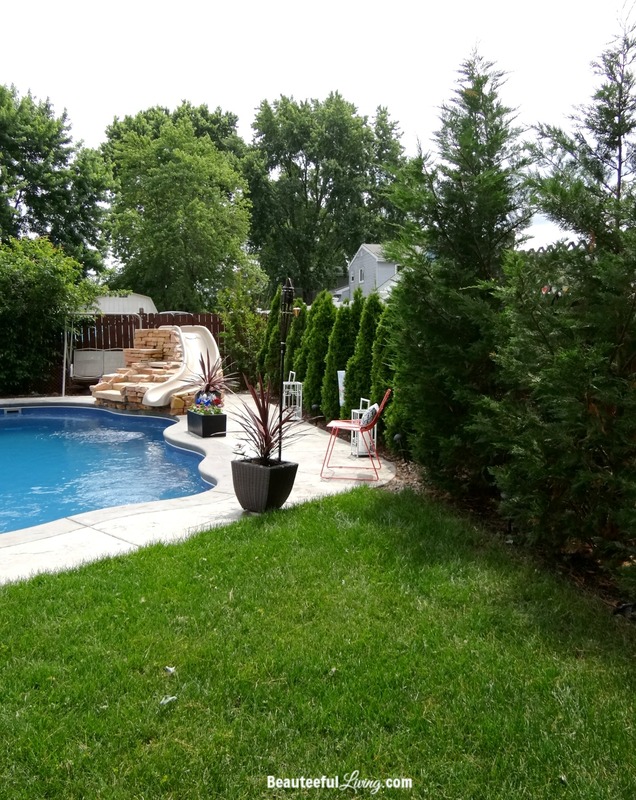 It won’t be long before you have a long evergreen wall behind your pool. 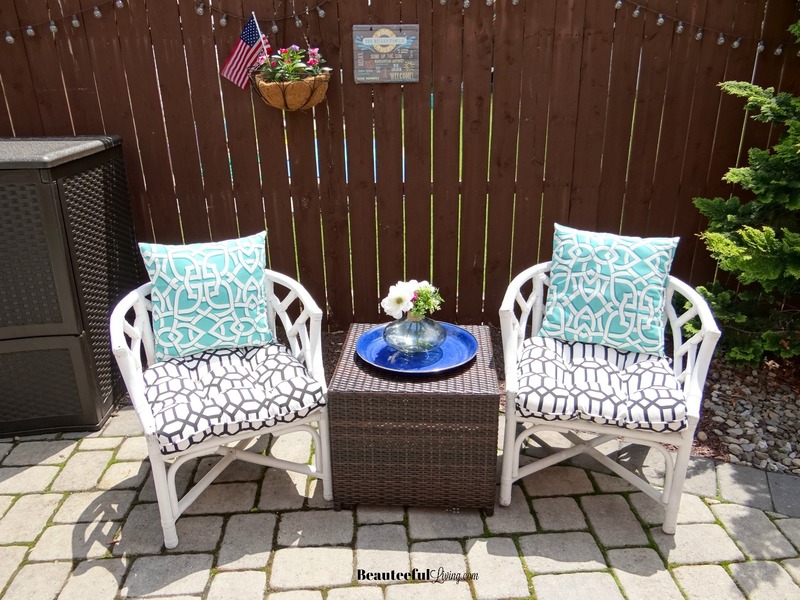 Have a wonderful summer and thanks so much for sharing your beautiful outdoor space! You have an amazing pool! I love the water fall. 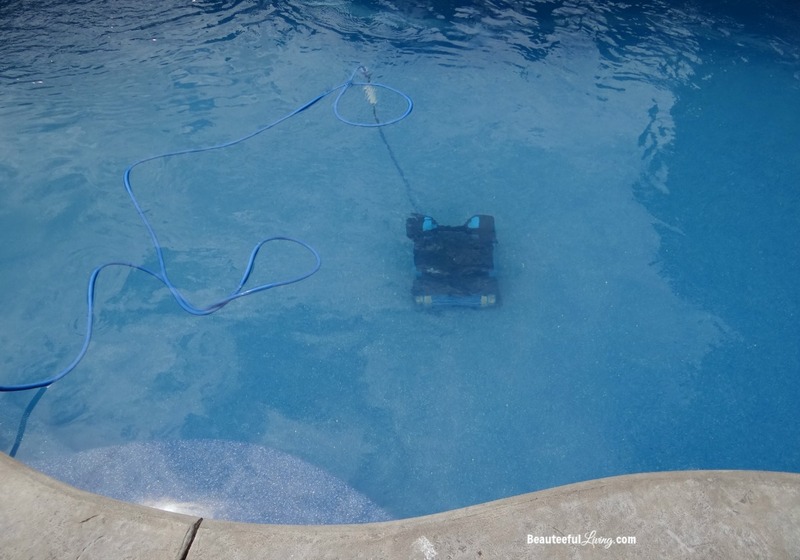 That robot that cleans the pool is really cool.I am sure your summers will be fun.